Homework assignment for the User Experience class at the Starter League, April 2014. Choose a challenge, or problem to solve. Learn about your audience and find needs to address. Exploratory research (field observation and interviews), need-finding, affinity diagramming, idea definition, personas, vision statement. To come up with a research topic, we brainstormed a list of ideas. My four-person team chose "make staying healthy easier for busy moms." What do you want to make better? What are the main things you want to learn? Where will you go? Why? We set out to conduct research in order to discover potential user needs and focus our idea. Prior to field observation, we defined the main scenario we wanted to learn about. We wanted to see busy mom's in one of their "natural habitats" -- the grocery store. Each member of my team conducted observations (and subsequent interviews) over a week's time on varying days and times. I conducted my field observation on a Sunday afternoon, assuming it was a common time for people to run errands in preparation for the upcoming week. For the most part mothers gravitated towards products that seemed to advertise “natural” ingredients, or were low in calories or “guilt free.” They also favored sweet baked goods that seemed healthier (muffins instead of cakes and cookies). I observed some moms purchasing frozen or pre-prepared foods, but even then they chose fish over other meats, or egg whites over whole eggs. Kid-friendly foods like Danimals yogurt, or applesauce were a common item. Overall, easy-to-prepare foods were favored. We took our insights from our research and pulled out keywords from our notes. By lumping these words and phrases together via affinity diagramming, we were able to start making connections between needs of mothers and problems they needed solved. While these personas come from different socio-economic backgrounds, they share commonality in their desire to become healthier in a way that will not be too difficult or time-consuming so they can focus on other obligations. Our research and defined personas let us narrow our focus even more. We created a Spark Frame to outline the one overarching problem we wanted to solve first, and potential solutions. 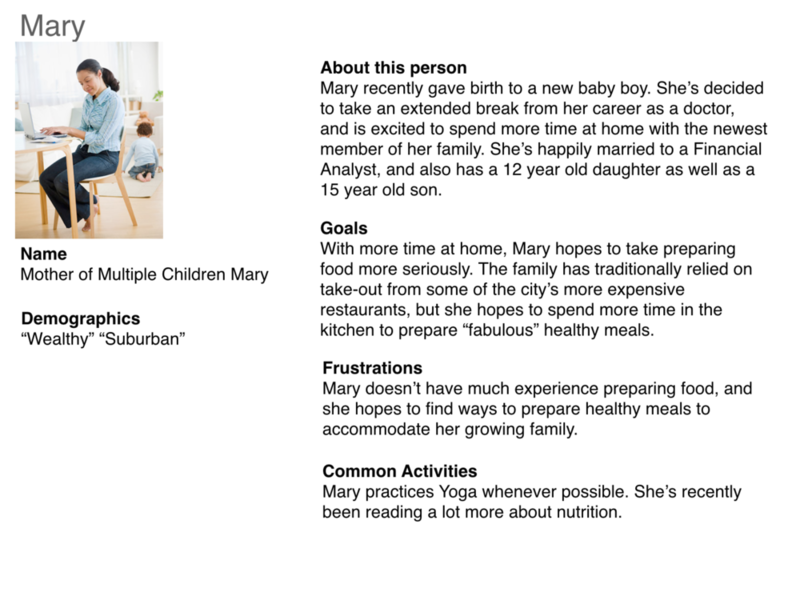 Based on our Spark Frame, the two main obstacles for this target audience are knowledge (what's healthy, what's not), and available time (moms of newborns don't have a lot of time for comparison shopping). Our original idea, "make staying healthy easier for busy moms," had now become "make comparing food healthiness less complicated for moms of newborns." app, where you scan a bar code, and get a green light or red light whether it meets health criteria - augmented reality? In implementing the augmented reality app we would need to keep lower income moms in mind (like the Valentina persona), so perhaps in addition to a smartphone app there could be a few scanners installed in the store that would serve the same purpose. The nutritional score would be good validation for those who strove to make healthy decisions when shopping to know what they bought in fact is nutritious. But for those that don't know much about nutrition to begin with, it's not that helpful. They would need something in addition to a nutrition score on their receipt -- maybe if your "score" on the receipt is low, it would also then offer suggestions for alternative healthier products that are similar to the unhealthy ones they bought.